This poster relates to the Mexican Revolution of 1910, which lasted about ten years. Exactly 100 years ago in other words. It has become a subject of fascination for me and, now to some extent, for Rick, too. 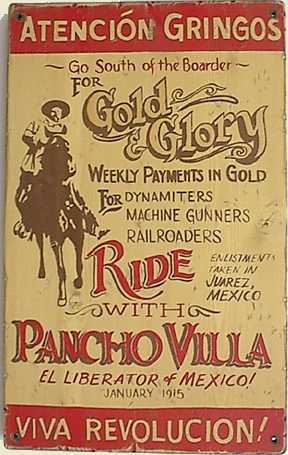 We have had some discussions as whether or not, had we been around and had the chance, we would have signed on to ride with Pancho Villa. This involves deciding whether we could have best passed ourselves off as dynamiters or machine gunners or railroaders. A lot of things to chew over there. 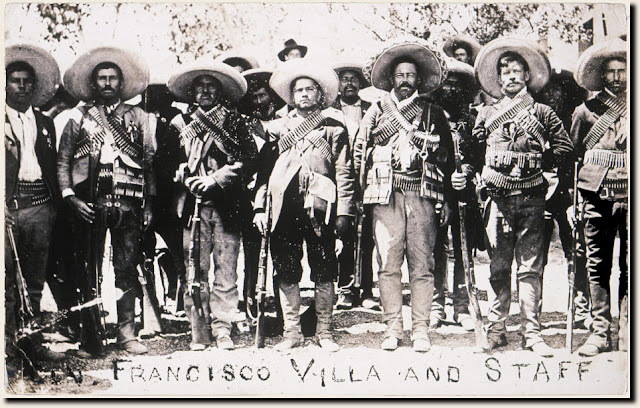 Now here we have the famous photograph of Pancho Villa and his staff. See that guy immediately to Pancho Villa's left? He looks like a gringo to me. I like to think that Rick and I could have carried ourselves as well in the clothes and with the equipment of that era. But alas, we shall never know. Which brings me to the subject of horses. Rick and I have horses out of the 3 Señores stables lined up to ride tomorrow. Mauricio Magaña operates those stables. He rescues starving horses and then brings them back into shape. His horses are in amazingly good shape. As I said, we ride tomorrow. Which in turn brings me to this complication. This is Mariana, the bartender in the Casa Payo steakhouse downtown. She is quite simply the most beautiful woman in the world. (Mariana is the one on the right. The one on the left is me.) Rick and I occasionally stop there for an old fashioned cheeseburger with fries. And of course she took an immediate shine to Rick. There is a room behind us there with several tables and several big flat screen televisions where you can watch sporting events from Mexico or the United States. Mariana is learning about baseball. She has only worked there since last August or September. Anyway, Mariana heard us talking about riding the horses before we had the horses scheduled. She asked if she could go, too. It is my theory that if you were to respond to a woman like this who asks to go along and ride horses with you by saying no, then you might as well go out behind the barn and shoot yourself because you are already as good as dead anyway. It just so happens that tomorrow is a day off for Mariana. However, she must try to change some other plans in order to ride. We are hanging fire on this whole thing right now waiting to find out if she is going or not. But what the hell? Mauricio just needs a little advance notice in order to get another horse up. We shall see. As for right now, it is siesta time. That part of Casa Payo steakhouse is called Manolo's Sports Bar. Here is a little video of it taken during Scott Wingert's visit, 20 October 2011. Scott is from rural Swisher, Iowa. 1. You underestimate Rick and me. 2. I do not put any special effort into this. I just notice. 3. Yes, probably I should. Perhaps next week I will shoot myself. Maybe the week after. Right now I am having too much fun. 4. Thank you. We shall. I know now that she is going for sure. I hope you both have a wonderful time. My attempt at humor sometimes falls flat. I don't know why you wrote that. I thought your attempt at humor came off pretty well here. Anyway, Mariana is confirmed. She is going with us along with her cousin, who is visiting here. He is a good kid. Wait until you see a picture of Mauricio Magaña. He may be the most handsome young man in the world. My great grand father ran from Pancho Villa from mexico. My aunt is currently working on a book. He turned against him and the revolution, to be told by other followers that he would be killed the following night. So he rod by horse back all night and day to escape Mexico. I always wondered how my all so blinding white skin had the last name of Perez and how that name came to America. Hearing this story makes me more appreciated of how awesome life is, and how different one action in the history of any man can change the future of so many others. Its incredible! Dillon, I appreciated your story. This post is a fantasy. In all seriousness I continue to try to come to terms with Pancho Villa. There is no question that he was a ruthless killer. During the Revolution at times he killed in the service of the poor. At times it appears that he killed for the sheer fun of it. I guess the best we can say of him is that he never killed in the service of the rich. Beyond that I still circle around this character trying to make sense of him.